Start by going to your “My Documents” or some other location on your drive. Create a new folder, and give it a name. I chose something short, “Dev”, since it’ll take up some space on the Start Bar and it was pretty descriptive. 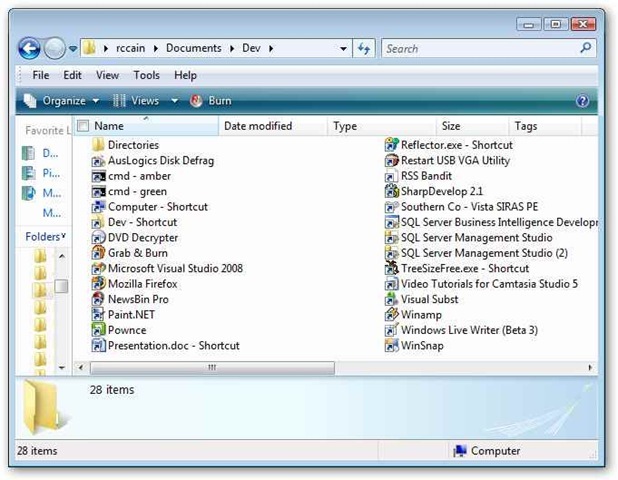 Now in this folder you should create short cuts to all the applications you use on a frequent basis. You can also create other folders, which will turn into submenus when we’re done. Here you can see I’ve got my shortcuts, plus one folder called “Directories” which holds shortcuts to folders I access frequently. Here’s a ‘best practice’ for you: I also find it a good idea to create a shortcut to the Dev folder itself, so you can quickly and easily add or remove shortcuts to your system. 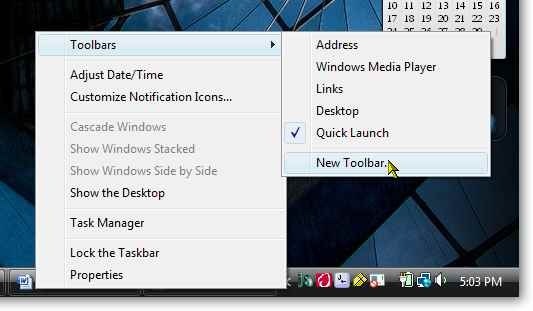 Once you have all of your shortcuts, right click on your start bar and pick Toolbars, New Toolbar (I’m doing this in Vista by the way, but it works equally well in XP as I’ve done it there for years). When the New Toolbar dialog appears, navigate to the place where you stored your “Dev” folder, click on it and click “Select Folder”. Now you should see a new item appear on your Start Bar with the word “Dev” (or whatever you named your menu). Here you can see my menu; I’ve highlighted the “Directories” submenu so you can see it working as well. If the menu doesn’t appear where you want it simply click on the little bar to the left of the name of the menu and drag it where you want. Your menu may also appear but “spread out”. If so, simply place the cursor over the bar, and drag it back into a collapsed position as I demonstrate below. You can create as many of these little do it yourself quick launchers as you want. 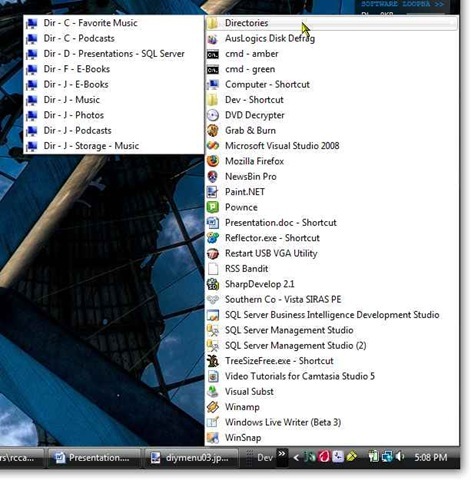 I usually have my Dev menu all the time, which holds my generic shortcuts or shortcuts to general items such as my RSS reader, Visual Studio, or Paint.Net. When I’m working on a big project, I like to create shortcuts specific to that project. 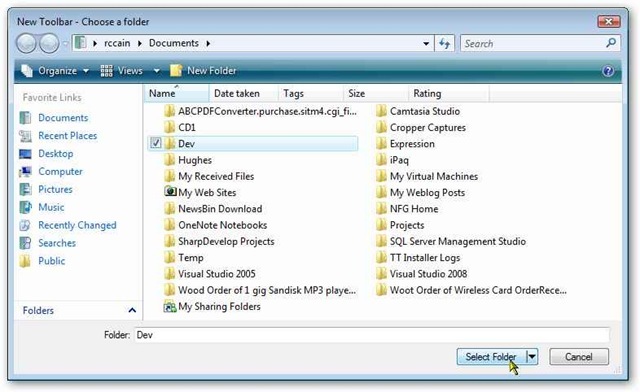 Thus I’ll create another one for that specific project that will open the folders where my source code or data is stored, has links to open the project right in Visual Studio, and more. They are easy enough to take off the Start Bar, simply right click on the menu again, go back to Toolbars, and click on the menu name. It will remove itself from the Start Bar, but the folder will remain intact for when “phase 2” of your project comes around. Using my “Do it yourself quick launch menu” I almost never need to go through the Start Menu. In addition it allows me to keep my Quick Launch toolbar extremely small, I only have icons there to apps I really do use many times a day. And the best part is it’s all built into your copy of Windows already. Nothing to download, install, no additional overhead, totally safe and secure. This is a real benefit when you work in an environment where you are not allowed to install any third party applications. Give it a try and see if you don’t find it a better way to work. That’s very nice ! After reading this post I remembered seeing this quite some time ago, but completely forgot about it. Thanx for posting this ! This will save me a lot of times searching for folders. I’m having problems viewing your page clearly with the latest version of Opera. Looks fine in IE and Firefox though.